Following last year's debut solo album, X-Communicate, Kristin Kontrol (the personal project of Kristin Gundred, f.k.a. Dee Dee of Dum Dum Girls) returns with a new single. "Concrete Love" sees one of indie music's most accomplished songwriters continue her soft evolution. "Can't we just talk like we are friends?" she asks, "Can we not pretend we're too cool?" 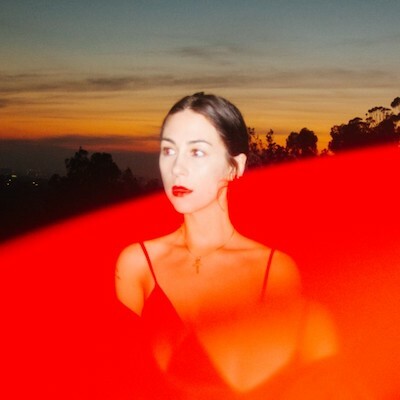 Splitting the difference between late-period Dum Dum Girls and X-Communicate, the pop DNA of this song has always been present throughout Gundred's career, but here, as Kristin Kontrol, it positively shines. Produced by longtime collaborator Andrew Miller, mixed by Alex Tumay (Young Thug, Metro Boomin, 21 Savage) and mastered by Heba Kadry (Slowdive, John Maus, Beach House), the single is out digitally 9/21/17 via Gundred's own imprint Hunny Music. In other KK news, Gundred and Miller just wrapped their first feature length film score for Tim Hunter's LOOKING GLASS out March 2018. Gundred is also currently producing Taleen Kali's solo debut as well as working on material for her next Kristin Kontrol release. "thaws some of [X-Communicate's] icy sheen to find the gooey pop center underneath"